contractor check Archives - Epic Paving & Contracting Ltd.
Reputable, Reliable & Customer Focused! Before you build your next big home patio or walkway, to contact your hardscape contractor and ask them these key questions. From what paving stones they are using to materials and installation costs, there are a number of important questions you need to ask. These will save you time and money, ensuring a smooth installation process. What is Used for the Base Materials? You might think that adding some paving stones or a retaining wall is an easy process. However, every homeowner should ask their hardscape contractor about the base materials and the compaction process. How does the contractor prepare the base? What materials do they use? Don’t forget to ask for details about the compaction process. Many projects require planned drainage to prevent damage from water-runoff. Ask the contractor if the drainage slopes away from the house. Have they taken your landscaping and other hardscape structures into account? For those in areas that are susceptible to extreme weather conditions, preventing flooding and water damage is crucial. Don’t forget to ask this important question. Every homeowner knows someone who undertook a large building project only to find out too late that they needed a permit. Decks, pools, and covered structures often require a permit. You can find out this information through your city. The contractor should also be able to help you determine which permits you need prior to construction. A professional hardscaping company will already have liability insurance. However, be sure to ask about the contractor’s insurance and workman’s compensation. This may save you significant hassle if any damage or injuries occur during construction. Be sure to speak with your hardscaping professional about these questions. Always feel free to speak with them about any concerns that may come to mind during construction. This entry was posted in paver and tagged contractor check, paving on October 18, 2018 by epicpaving. 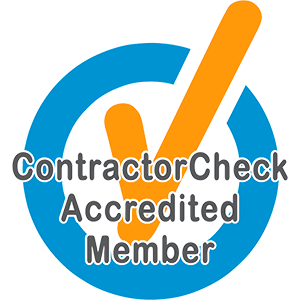 Epic Paving and Contracting is proud to announce that we’re a ContractorCheck accredited member. When you’re selecting a contractor, you’re putting your trust in them. You want to ensure that their health and safety record is top-notch, and that they’re fully trained and licensed. You’re trusting them with your property. That’s where an independent, third-party source like ContractorCheck comes in. ContractorCheck is an independent third party health and safety pre-qualification accreditation program for contractors. They accredit a wide variety of contractors from hundreds of trades, ensuring that their contractors show a commitment to health and safety. They assess the health and safety management systems contractors have in place, and compile a list of accredited companies you can put your trust in. Any ContractorCheck Accredited contractor you engage with has demonstrated that they have a safety program that satisfies federal and provincial legislation, as well as client specific requirements. Every assessment is assessed or accredited by an experienced Canadian Registered Safety Professional. It’s a thorough assessment, reviewing all relevant policies and procedures, as well as providing advice on how contractors can meet the highest standards. They support and encourage the contractor throughout the process, until they are assured that the contractors meet their highest standards. What does this mean for you? That means when you pick a ContractorCheck accredited contractor like Epic Paving and Contracting, you don’t have to worry about whether or not they’re compliant with laws and regulations, or if their commitment to health and safety is lacking. It’s a way to put contractor safety at the forefront of your contractor selection without requiring the excessive legwork required to check out every contractor yourself. This will reduce the risk of accidents on your job sites, and give you peace of mind. Epic Paving and Contracting goes to great lengths to ensure we pass our annual assessments. This isn’t a one-time accreditation; it’s an ongoing system of checkups to ensure that safety policies and procedures remain in place. We put health and safety at the forefront of our concerns, and this accreditation helps demonstrate the level of our commitment. Let us take some of the risk out of your contracting! The orange checkmark means that we’re a safe, health-conscious organization who will provide a safe workplace on your property. 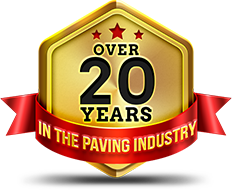 Epic Paving and Contracting will provide the best – and safest – paving services in the Greater Toronto Area. This entry was posted in Accreditation and tagged contractor check on April 4, 2017 by epicpaving. We recently had our driveway paved and new interlock patio created. Copyright © 2019 by Epic Paving & Contracting Ltd. All Rights Reserved.